Apple in December was served, and complied with, a request from Chinese authorities to remove all instances of the New York Times news app from its regional App Store for violating unspecified local laws. Highlighted in a report from The New York Times on Wednesday, Apple's decision comes as the company performs a delicate balancing act between tapping into China's booming middle class and adhering to its stringent media ruleset. According to the report, Apple without warning removed both English and Chinese version of the NYT app from its China App Store on Dec. 23. The publication notes apps from other international news organizations are still live, suggesting The Times was targeted in the takedown. "We have been informed that the app is in violation of local regulations," said Apple spokesman Fred Sainz. "As a result, the app must be taken down off the China App Store. When this situation changes, the App Store will once again offer the New York Times app for download in China." Sainz did not disclose how Apple was notified of the infraction or by whom, nor did he elaborate on whether the company had been served a court order forcing the app's removal. The Times speculates the request or legal entreaty might be rooted in a new set of regulations called Provisions on the Administration of Mobile Internet Application Information Services. Released in June 2016 by the Cyberspace Administration of China, a body which oversees internet censorship, the "mobile internet application information service management regulations" relate specifically to apps, saying such software may not be used to "endanger national security, disrupt social order, violations of the legitimate rights and interests of other laws and regulations prohibit activities." Germane to the NYT app, the rules expressly prohibit the publication and dissemination of "information prohibited by laws and regulations." The stipulation on content is at the crux of the matter, according to The Times. Of note, Chinese government agencies began blocking NYT websites in 2012 after the publication posted a series of articles critical of former prime minister Wen Jiabao. While the CAC and other branches were successful in censoring internet content, they had difficulty blocking people from reading the same news through the Chinese-language iOS app, The Times said. Apple has in the past promised to comply with the rules and regulations of countries in which it operates. However, as seen in last year's kerfuffle with the FBI, Apple is not one to roll over when its stated core tenets of user privacy, inclusion and free speech are threatened. While The Times does not lay direct blame on Apple for yanking its app, the tenor of today's article implies the company is putting profits ahead of principles. 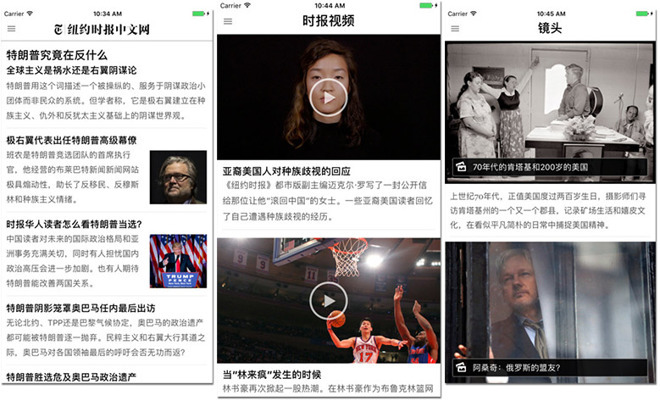 In particular, the timing of the app's removal is suspect, as the publication was working on a number of stories pertaining to the Chinese government. One story, published on Dec. 29, revealed billions of dollars in "hidden perks and subsidies" the Chinese government gives to Foxconn. On Dec. 23, the same day that the NYT app was pulled from China's App Store, a Times reporter contacted Apple's media team and the Chinese government about the article. Whether the line of questioning resulted in the app's removal is unclear.